A friendly post by Corey Robin picks up on a discussion about what counts as financialization and what does it mean politically. Robin argues that a key feature of the “financialization of political discourse” is to assume that the financial industry is the natural constituency in a debate about financial regulation. As if everyone else didn’t have a stake in how financial markets are organized and regulated. This speaks to one of the more perplexing features of the post-crisis politics. Despite a great deal of resentment aimed at bankers, and despite their role in increasing rather than managing systemic risks, they have played one of the largest roles in shaping post-crisis oversight. It would seem that it takes more than a crisis to shake the tendency in the US to allow those who appear to be experts to rule their domain. 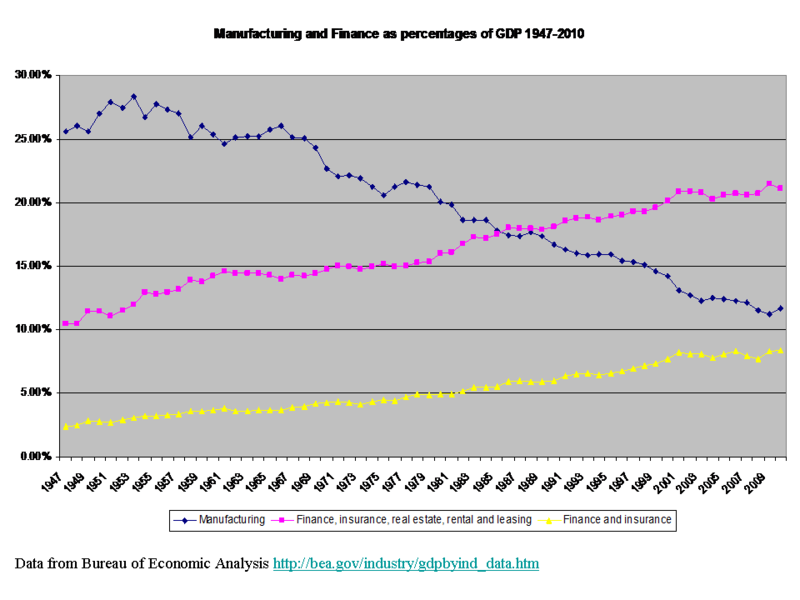 While in 1947 manufacturing accounted for 25.6% of GDP and finance, insurance, real estate, rental, and leasing accounted for 10.5%, those quantities are now almost reversed. In 2010 manufacturing accounted for 11.7% of the value-added, while the above financial activities accounted for 21.1%. There is undoubtedly more to the story than one graph can tell. Value-added, for instance, may not be the best way of presenting changes by sector. But the lines still tell a story, and that is of a social choice to make financial activity dramatically more important – and manufacturing less important – as a part of our economy. Of course, the above figures alone don’t tell us about the desirability of the choice. But its stated benefits – more efficient allocation of resources, better management of risk, superior management of the economy – have not stacked up. There are wider questions to which we shall have to return – how financialization was linked to the stagnation of living standards for the working class but rising wealth for the upper class, how it was linked to industrialization and thus improvement of living standards in China, and the concrete relationship between financial and industrial sectors. For now it is clear that financialization is not just about allowing a new group of ‘experts’ a share in ruling, but about dramatically restructuring the economy itself. That is a choice that might need some rethinking. Being skeptical by nature, I have to ask what your graph really shows, and what is actually meant by “financialization.” From the late nineteenth century until the end of World War II, railroads, steel trusts, and great holding companies of all sorts sold bonds directly to the public, so the value added by the “financial sector” was of course much smaller, but not the power of money. Increasingly, however, the function of floating bond issues and stock IPOs has become a specialized one, entrusted to investment banks–your financial sector–which have therefore acquired political power commensurate with their function. But the fixation on this power begs the question of why functions once handled within industrial firms have been externalized. A sort of “reverse Coase theorem” is needed: what is the source of the efficiency gain from externalizing the financing function? One hypothesis might be the increased complexity of the economy. How are investors to evaluate the quality of “intellectual property,” for example, so much less tangible than a railroad or a steel mill. Hence the increased importance of reputational intermediaries,with their specialized analysts, networked information sources, etc. In what sense, then, does such an economic function constitute a political power resource? That is the question you’re really asking, and the answer requires a finer analysis than an aggregate index such as value added by sector can provide. I also remain skeptical of your comments, and of Corey Robin’s elaboration of his earlier comments, about the “stake” we all have in “how financial markets are organized and regulated.” It’s a truism to say that we all have a stake, but the issue in this particular instance is how best to articulate the interests of non-bankers in shaping the regulations of the banking system. After all, if you were to put to the public a referendum question about what Tier I capital ratio requirements should be imposed on banks or what kind and amount of collateral should be required for overnight repo agreements, the results would not be very satisfactory, since the general public has no notion of what these terms even mean. Technical questions must be resolved by technicians, which then raises the principal-agent problem of how the technicians’ actions are to be monitored to ensure that they act in the general interest. Obama appointed Daniel Tarullo to the Fed Board to represent the public’s interest because Tarullo actually knows something about what the Basel I and II agreements meant and how banks evaded their requirements. But whether Tarullo has been effective in that role or been overwhelmed by the other interests represented on the Fed board is hard to say at this point. As Chou En Lai said (apocryphally) about the French Revolution, it’s too soon to tell. But it’s at least arguable that a single well-placed expert technician at the heart of an opaque regulatory institution can be more effective than a presumably more democratic deliberation in a legislative institution. I can’t quite pin this charge on you from what you’ve written thus far in the blog, but there is at least a hint of fetishization of social movements, democratic deliberation, and legislative debate at the expense of supposedly less democratic institutions of oversight, control, and regulation. Pierre Rosanvallon’s last several books (which I’ve translated) push back against this tendency among democratic theorists. Pierre’s argument doesn’t do full justice to the problem of regulatory capture, in my view, but he does persuasively argue that we need to understand “democracy” as something more complicated and multifaceted than “rule by the demos.” But perhaps I’m reading more into your comments than you intend. Just to be clear, I wasn’t talking in my post about the regulation of financial markets. I was talking about something much more specific: the question of public debt. And that the question of public debt was traditionally considered a fundamental political question, and despite the technical issues and questions of expertise that Art raises here, it remains so. Witness the extraordinary battle we’re waging about it now. What struck me in Frum’s post (and Art’s earlier comments) was the assumption that the banks were the natural, and perhaps only, constituency in this argument b/c they were the only ones with an immediate stake in what happens. Clearly that’s not the case, and whether we think experts are required to speak on behalf of other constituencies in the public or we think they can speak for themselves, the point is that the question of the debt is not only a question for banks. I realize you guys here were pivoting off into another equally (if not more important) area, but I just want to be clear about what I was and wasn’t saying. So what is the implication of saying that “the public debt was traditionally considered a fundamental political question … and remains so?” I certainly never assumed “that the banks were the natural, and perhaps only constituency in this argument b/c they were the only ones with an immediate stake in what happens.” I have an immediate and personal stake in what happens: I own treasury bonds, I use banks whose capital is in treasury bonds, etc. The entire financial system, which affects everyone, depends on the “full faith and credit of the US government” to oil its basic machinery. So I get it. Everyone has a stake. Et après? The fundamental issue, in this as in many other areas of modern governance, seems to me to be the need to manage matters requiring a high degree of technical competence when the sovereign power rests in the hands of people who do not possess that competence. Without institutions to resolve the resulting principal-agent dilemma, you wind up in the situation in which the US finds itself at the moment, with demagoguery, bad faith, and ignorance in the driver’s seat. Frum calls upon the banks to bring their weight to bear not because he wants the banks to rule but because he thinks the banks’ self-interest will force them to cut against the bad faith that holds a de facto veto power in this Congress. The last thing the banks want is a US default. Republicans like Frum and Brooks, hoist by their own petard, see their own party in the grip of a vindictiveness so powerful that they’re prepared to court chaos in order to see Obama fail. That’s not a consequence of financialization; it’s a consequence of anti-elitist populism gone amok. Perhaps I should add, for clarity’s sake, that I don’t think raising the debt ceiling is “a highly technical matter.” It’s a no-brainer. Since history has been invoked in this discussion, it’s perhaps worth mentioning that the ceiling exists only because of a historical error that was made in the first place to placate the electorate and hide the technicalities of public borrowing during World War I. When it became necessary to issue Liberty Bonds to finance the war, Congress couldn’t satisfy itself that it wouldn’t be giving the executive branch carte blanche to spend whatever it saw fit without congressional authorization of every last appropriation for bandages and gunpowder, so it imposed a limit on borrowing. It couldn’t manage the details, but it would manage the bottom line, or so it thought. This was and remains an unsatisfactory institutional solution to the principal-agent problem I discuss above. As things stand, the people’s representatives are in the position of a buyer who contracts to buy a basket of goods for $X and then refuses to pay on the grounds that he promised himself he would borrow no more than $Y, where Y<X. But insofar as making contradictory promises is an inherent tendency of democracy, it's a problem for democratic theory to reduce the likelihood of its happening by proper institutional design. Art, we’re going in circles here. I initially objected to Frum’s formulation b/c it seemed to assume no one besides the banks had an immediate stake in this debate and thus only they could be rallied by Obama. As you rightly point out, everyone has a stake in it. It’s a “no-brainer,” and I agree. Which is why I thought that Obama could have rallied many constituencies to make that case, constituencies besides the banks that could put pressure on the Republicans. Obama could spell out quite clearly what would happen if the US defaults in ways that are perfectly easy to understand, and that would rally — as Josh Marshall pointed out last night (http://talkingpointsmemo.com/archives/2011/07/dumbfounded.php) — core Democratic constituencies and even larger constituencies beyond that. That to me is why the debt is a public question and could conceivably be resolved as a public question, without looking solely to the bankers. I wasn’t making an anti-elitist, anti-expertise point; I was making what seemed to be an obvious point, with which you seem to agree. But then you reply, first, that the problem is one of expertise–the public lacks it, is ignorant, etc., and therefore the decision-making power must be given to competent experts. And then you reply, well, no, it’s not so complicated; it’s really a problem of political will. Only the problem of political will is not Obama’s lack of it, but the public’s (or its representatives) lack of it. The public wants to have its cake and eat it too (I take that to be the point of your WWI reference). Or it’s the Republicans’ lack of political will to stand up to their own base. But we don’t really know that in this case b/c Obama hasn’t really tried to make the public case. Certainly not in the dramatic simple terms that many like Marshall have suggested. Anyway, I’m not really sure what all this principal-agent and institutional design talk has to do with this. You have a hard-right faction in the Republican Party, which all the polling shows is a minority. And you have a president who seems absolutely allergic to making a public case against them probably b/c, as Kevin Drum points out here, he wants a deal more than anything else (http://motherjones.com/kevin-drum/2011/07/understanding-obama). I don’t see that as the triumph of populism or the failure of institutions. I see it as a symptom either of Obama’s weakness as a leader, which is what some claim, or his ideology (he really wants to deal with the Republicans as opposed to confront them b/c he really wants to cut spending). In either event, it’s the leadership that’s the problem, not the assembled masses. One quick note on WWI that seems relevant to all this. As you know, Liberty Bonds were a fallback measure. A good part of the progressive wings of both parties wanted Wilson to raise taxes on the wealthier segments in society. Wilson initially agreed, but was pushed back by Wall Street and those segments. So he settled for Liberty Bonds and ran up a huge public debt. Not b/c the public didn’t want to pay (they did pay), not b/c of some kind knee-jerk anti-elitist populism, but b/c Wilson didn’t want to confront these influentials. Sound familiar? Corey, I think you overestimate the power of the presidential bully pulpit and underestimate the irrationality of the public when it comes to thinking about the public debt. I’ll leave it at that, because the debate between us is not germane to the topic of this post.